I submitted some images to you almost exactly a year ago (back stage with the x-pro 1), which you kindly placed on your site. Since then you have had some really valuable reviews of various new camera models, and the one that tempted me most was the Leica Q, so much in fact that I put my name down on the pre-order list! 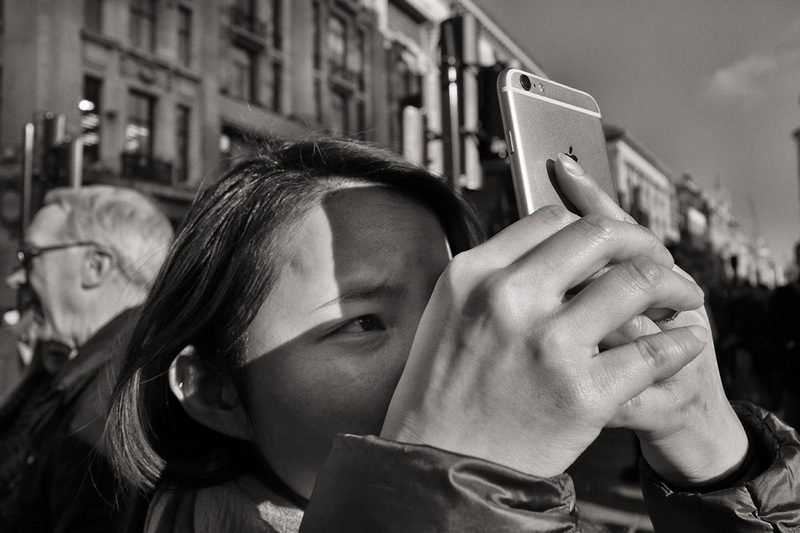 I must say it has not disappointed…it is an ideal tool for the type of street pictures I like to take. As you see from the images here I like to work very close to the subject, but at the same time to keep “invisible”. 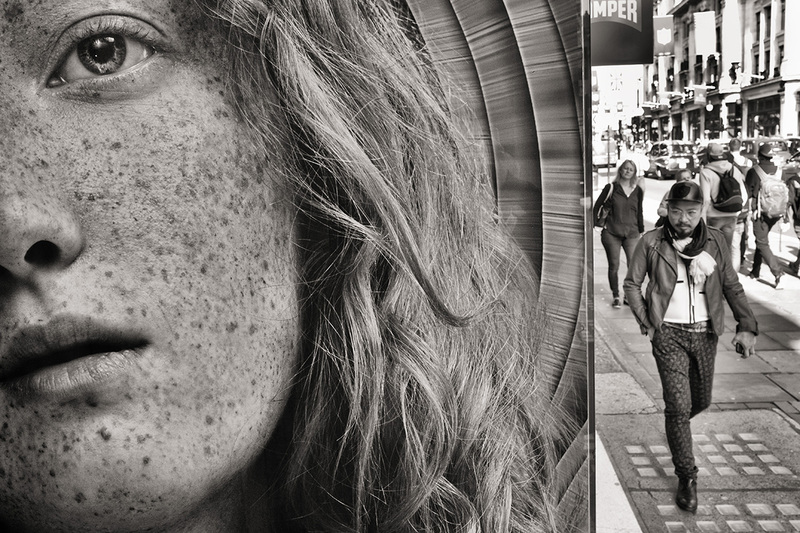 I am not a very patient person, so I try to squeeze interesting images out of the mundane, and I thrive on very busy streets where it is easy to blend in and not ne noticed. The 28mm lens on the Leica is ideal for me as it creates a feeling that you are “in and amongst” whatever you are shooting, which you do not achieve if you are zooming in (I think this gives a more voyeuristic feel…which is fine if it is what you are after). The very quiet shutter is perfect and nobody has heard me yet…which used to happen sometimes with the Fuji, and I also have the option of the silent electronic shutter. The EVF is perfect and shutter lag is virtually non-existent. Focus wise it is a game changer. I use three different settings for focusing depending on the situation, zone focusing and face detection auto when I am shooting blind, and manual focusing when I am shooting using the viewfinder. The face detection mode is very fast and has allowed me to get shots I would not have been able to catch manually (the girl wearing a blue hat is a prime example of this) Granted sometimes it focuses on the “wrong” face, but this is a price worth paying for when it works as you wish. 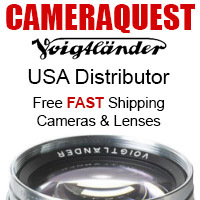 It also allows you to shoot blind with a wide aperture and throw the background out of focus…even with the 28mm lens. Thanks again for all of the great work you put into your site. Do let me know if you would like any more information. Olympus PEN-F Pre-Order Links! SHIPS MARCH! I currently use the M240 and I am looking at the Q. Your thoughts. Now this is great street photography! Great work!!! 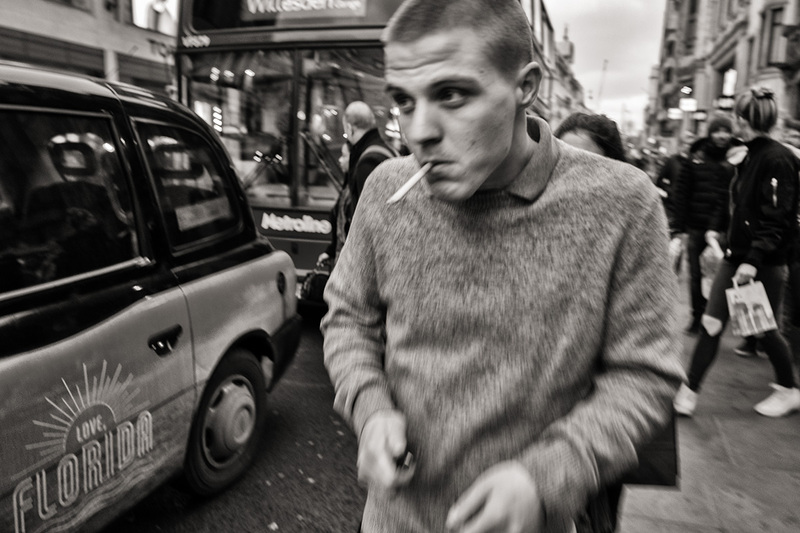 Leica is still the Kong of street photography!!! Interesting images. 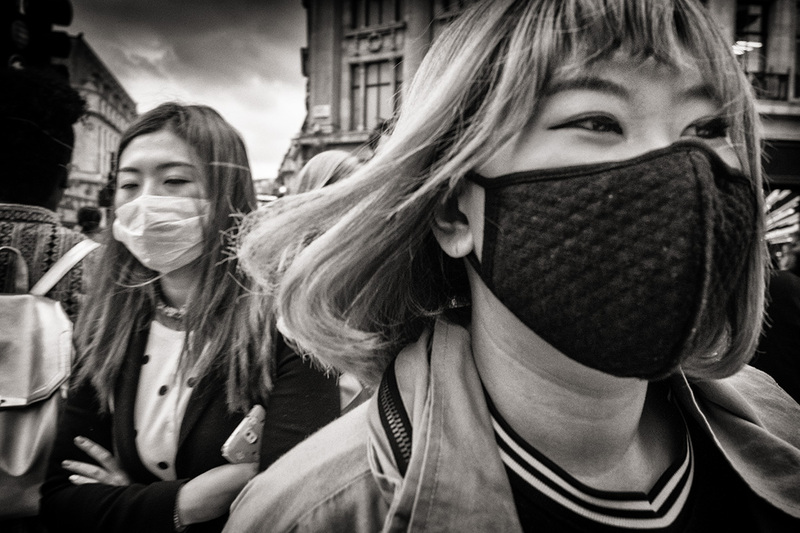 Shades of Tatsuo Suzuki, though not as harsh, maybe even too grey-ish. The blue girl looks like an experiment; not sure it worked. Would like to see it in plain monochrome. Nice. Blue hat . . . and lipstick . . . for me too. Great color. But it should work well in monochrome as well, especially the hat and the red lips. They’d match. I prefer monochrome, but sometimes color just works. I haven’t tried my Q yet for real street shooting, but it has everything you need, especially the rapid focusing and quiet shutter, not to mention the speed of operation. I still think many participants here don’t realize that the 28 on the Q with a 24 MB sensor is not the same as on on film or a lower resolution sensor. The 35 and 50 crops work quite well if you plan on anything 8×12 or even 11 x 14 for the latter. I just took some classical duet concert photos last night with my M Monochrom and 75mm lens. Great range of light on the stage from black to well lit face and arms of the violinist and bright white on the sheet music due to the spotlight lighting. Worked fine. The from the same viewpoint I tested the Q with its “distant” 28mm, set on 50mm for framing. Also worked fine, even for highly cropped 5×7 and 4×6 inch closeups (print, page publication or web size images). As you might suspect, classic concert goers do not like any kind of motion or noise distraction. The Q was silent compared to the MM. Noticing how the MM’s LCD flashed its presence after every shot, I decided to shut it off on the Q and only use the viewfinder. Consequently, totally silent, totally dark. I might has well been using binoculars. With the MM, I would only shoot during breaks or just before playing began out of respect for the people around me (I was on the far left isle). The Q was so invisible that I decided to shoot as many as I liked during the performance. Too late for you to post the blue hat one in B&W? ‘Henry in his Living room’ and ‘Mrs Grant’ are absolutely brilliant; poignant, wonderfullly lit, evocative and communicative. There’s lots of other really fabulous stuff in your site as well but these two environmental portraits are my favourite. I am a street shooter like yourself and I must say I like these images.I shoot with a 35 on an old M8 (50 equiv). I would have been dubious about using a 28 but your work and others I has seen prove otherwise. Love the black and white rendering of the new Leicas not the same as the CCD sensors but better than most other cameras for Mono images. It’s the photographer though at the end of the day that counts – as your images show! Love the color shot with the lady in the hat. Wow. 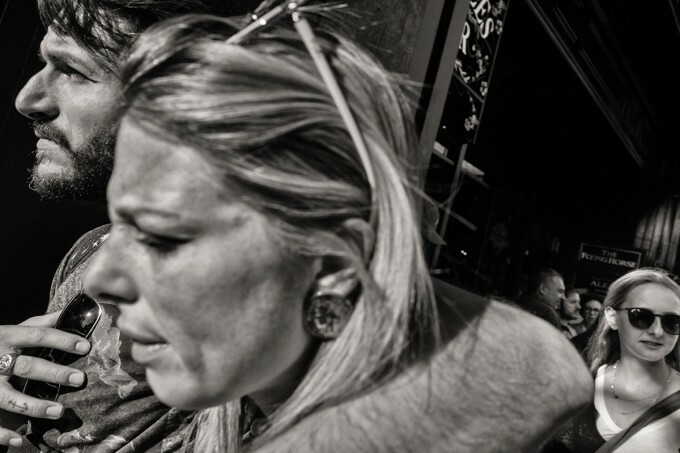 I love your take-no-prisoners, in-your-face style of street photography. You need a lot of balls to get that close. I love the image of the girl in the blue hat. She gave you that quick, cold, engaging, standoff look. And you won. Super pictures! 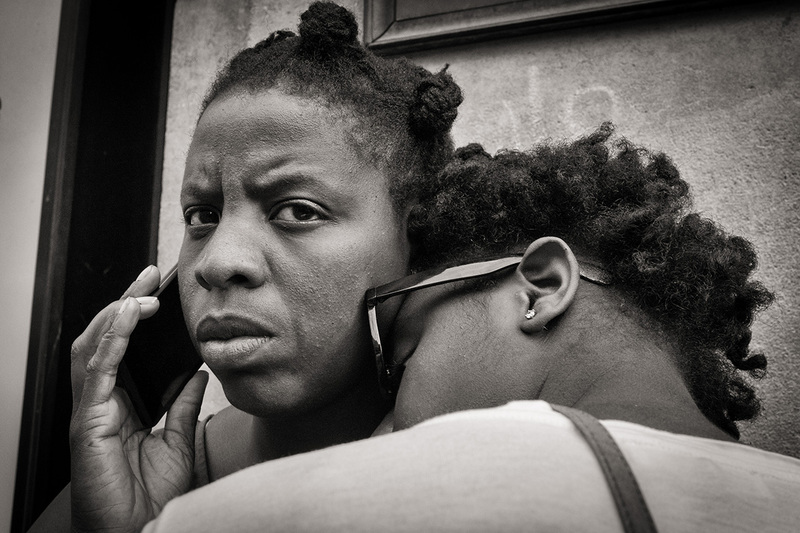 I am also tryng to get as close as possible to the people i photograph. The girl in the blue hat doesn’t, do it for me. I prefer the grittiness of the street. For me it captures life , that my personal opinion. The girl in the blue hat is too much girl and not enough woman yet. There is a world of difference between them . Great set of images, stephen. How much PP goes into lighting levels etc? Blue hat girl for instance is stunning for its lighting and saturation, especially if it was done via face detection snapshot. 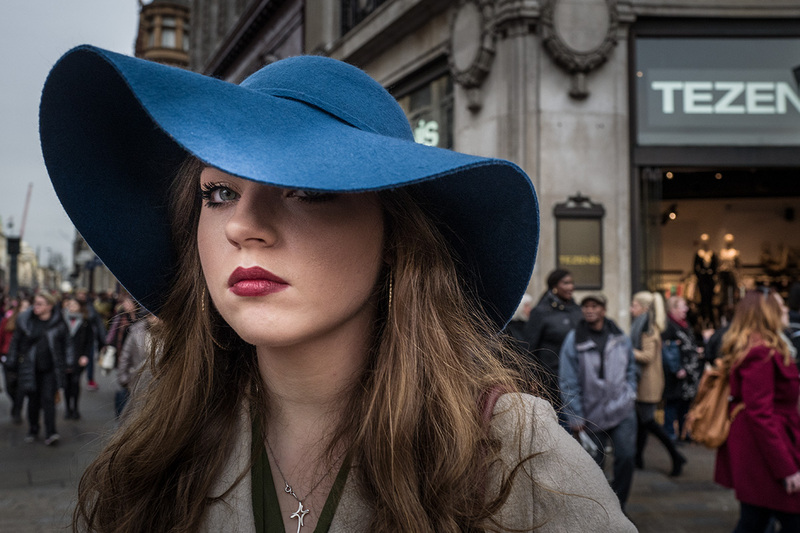 Usually, I’m a B&W purist for street photography, but “girl with the blue hat” is stunning. Composition, lighting (especially in her eyes), flowing lines of the hat brim and cool blue against her warm skin tones. Just stunning. You really do like to work close up. What settings do you use for the zone focusing? How do you hold your Q camera? Do you have it on a short leash, meaning a shortened strap? Or do you raise it up at the last moment? Do I detect more aggressive post-processing with some of your images, or are you consistent and areas that look a bit processed merely reflect being out of focus? It is really valuable when a knowledgeable photographer gives insights into the uses of a camera like you have, thank you. Your photos are sensational, so many intriguing images. My favourite would be the image of the smoker, the ‘movement’ of him just draws my eye every time. Great shots, really that close on your subjects or some cropping afterwards? Love your pictures. Well done, your chronicling of life is so refreshing and a throw back to some of the great street photographers of the past. Keep at it ,without photos the future will not know the past. Humanity is the best subject of all. Endless in diversity and creativity ! Nice images. I too love the abilities of the Q. The image quality is out of this world and it’s nice and portable. 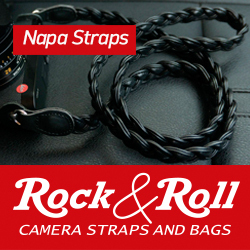 Perfect for street photography. Beautiful images, a uniquely different approach to street photography. Girl with blue hat is my favorite in this series. Love your photos. I’m really enjoying the Sony RX2, but the Leica has some great features to it. I thought long and hard about buying it. Of course, you also have a great eye and sensibility: which would carry over to any tool you use. Thanks for sharing.